Gardening can beautify your neighborhood, reduce your stress level, cut your home energy costs, and burn up to 600 calories per hour! Planting just one flowering plant also provides pollen or nectar for pollinators. You’re helping plants produce seeds and fruit for our food supply, nature, and reproduction. Together, we can restore the health of the pollinator population. 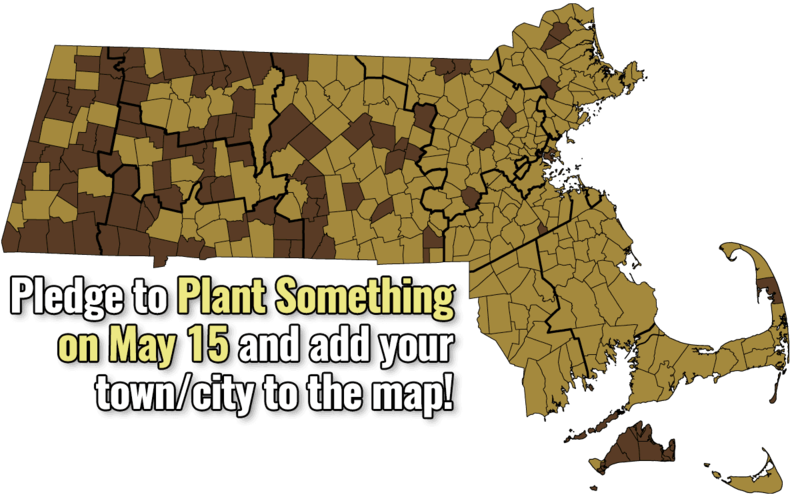 I am pledging to Plant Something on May 15! Check back often for the most up to date information and share photos of your planting progress on Facebook, Twitter and/or Instagram. You can also click one of the social media icons at the bottom of this page to share the pledge form with family and friends! Not sure what to plant? Visit our What to Plant page for information on native pollinator plants and more! Wondering what your mystery seeds are from the Boston Flower & Garden Show? Click here for more information.